One of the things I love doing is baking. As a stay at home mum I do quite a lot of cooking but only recently has Clem been getting more involved. I know what you are thinking, the mess!! Well actually she hasn’t really made a lot yet. We’ve had some spilt flour and sugar but nothing too bad. 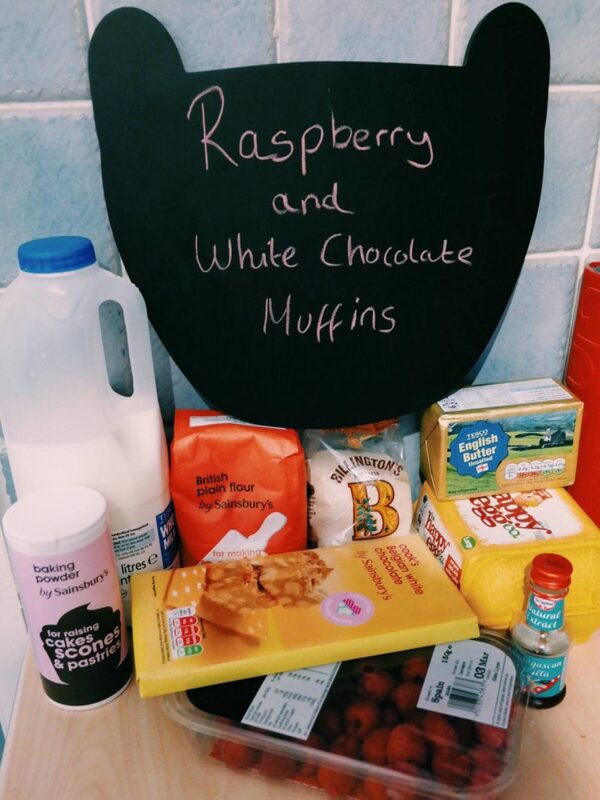 So with Mothers Day coming up I thought we would make some raspberry and white chocolate muffins together. I love both of those things and muffins so yum! Chop the raspberries in half and break up the chocolate. Sift the flour and baking powder into a large bowl, then stir in the sugar. I prefer using a ceramic bowl rather than a plastic one. Melt the butter, I did mine in the microwave to make it a bit quicker. In another bowl crack the egg, whisk in the vanilla extract, milk and melted butter. Then add all of the wet ingredient to the dry ones. Stir. Fold in the raspberries and chocolate using a metal spoon so as to not damage the raspberries. If you aren’t bothered by that then just use a spatula or wooden spoon. Spoon out into the muffin cases and bake in the oven for 25-30 mins until risen and firm. I always use an ice cream scoop to do this so that I know each case has the same amount in. Leave to cool. If you can wait that long and then eat! If you do eat them straight out of the oven watch out for the melted chocolate. As you can see Clem was keen to start and we had minimal spillage which surprised me. I thought she would make a lot more mess. She really liked stirring all the ingredients together, obviously I handled the melted butter as it as hot but she helped with every thing else. The muffins turned out super yummy and sadly haven’t lasted long enough to take a final shot because Daddy found them very yummy! Do you do any cooking or baking with your little one? We will definitely be doing more. We have also linked up with the lovely Steph and Lorraine for #LittleAppetites so if you are into baking with your little one then check it out.